Free download Mafia Shootout game for PC. It is 2D shooter game developed by Shmehao Games. The game is very light weight and easy playable. After starting the game, there are some guidelines for gameplay with step by step scenario. Game control is very easy and both mouse and keyboard are used in this game. The mission of Mafia Shootout is to escape the Don’s mansion from mafia. Your shooter is in the truck followed by mafia vehicles. 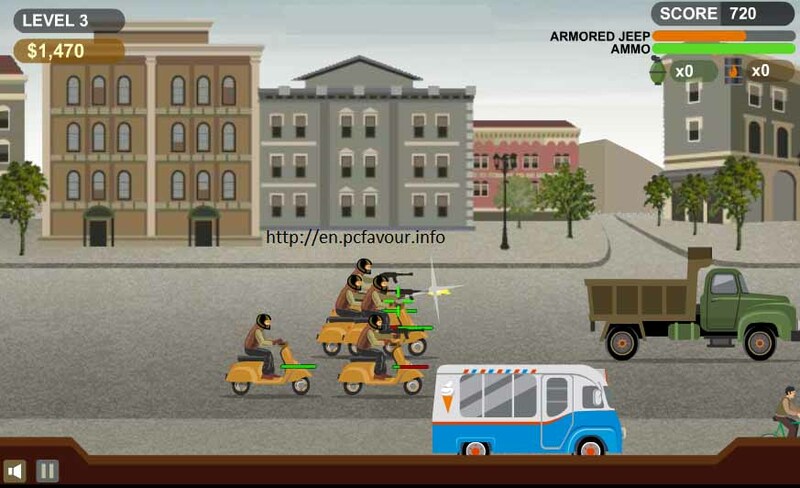 The screen will show the view from side, and the gun, which you will see, belongs to your shooter in the truck. To target vehicle, you have to use mouse movement and click. You can also release the oil from truck and also can attack with hand grenade. Each level ends if you remove all vehicles. Remember that oil and hand grenades are limited (only 2 of each). Shoot the mafia vehicles that are in pursuit. Ugrade weapons, health, and vehicle defenses. Shoot them down as you escape to the safety of the Don’s mansion! Prepare for a real challenge in every mission of this shooter.